Students need parent teacher communication. We need to work together to help kids. There are three essential times for parent teacher communication. I’ve been a teacher for fourteen years and a Mom for twenty. I’ve seen the good and bad from both sides. Here’s what I’ve learned. Seasoned educators stress that the first parent communication should be positive. Make a phone call. Host a meeting. First impressions are everything. If the first time you call a parent, it is for bad news, they are going to dread hearing your name. Set expectations for ongoing and emergency communications. Make your first communication positive too. Send a note. Be helpful. Set the tone. Even if you’re busy, a quick email to say you’re excited will help. Tip #1: Start strong, eager to get along. Share pictures, stories, and successes. Tell parents when a child succeeds at something. I try to communicate with parents every 7-10 days or when a major project is happening. Go to ballgames. Be where the kids are. You can build great relationships at events. Give teachers time to respond. If you email, realize that they are teaching during the day. If you text, be respectful and don’t do it too late. Communicate concerns with the teacher first before taking it to the principal. When you don’t, you aren’t partnering, you’re trying to coerce. Tip #2: Communicate consistently. Know how the other person likes to communicate. Listen. A child gets teased. Something happens, and the teacher is involved. Nowadays, people who gossip have fingers of fire. Rumors fly. When problems happen, I tell the principal and quickly call the parent. I want them to hear it from me first. I prefer verbal conversations over email. Problems at home. If a close family member is ill, a new child is born, or parents are divorcing — tell the teacher. Children internalize hurt. Eventually, it comes out in behavior. When teachers know, we can better understand a child. We can be more understanding. Problems with the teacher. Listen to your child’s complaint. Before you communicate your thoughts with the child, contact the teacher. Hear the teacher’s side. Advocate for your child. But realize that children need to be in a successful mindset to succeed with that teacher. You destroy that mindset when you criticize the teacher in front of the child. Teachers aren’t the enemy. We can work it out if we give each other the benefit of the doubt. But in the end, kids need people who care more about doing right than being right. The success of our children is in our hands. Let’s clasp hands in helpfulness. Let’s work together to help kid’s lives be awesome. 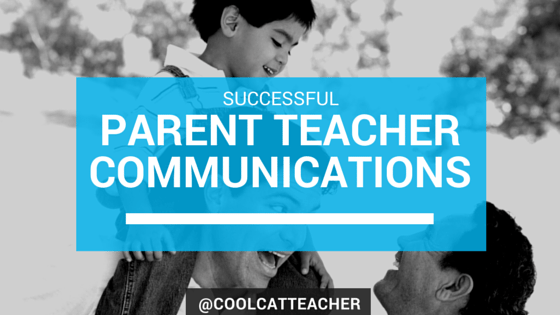 The post Successful Parent Teacher Communication Tips appeared first on Cool Cat Teacher Blog.